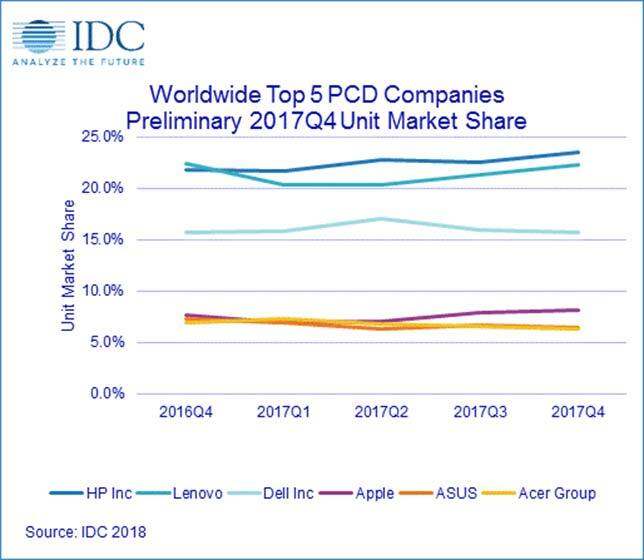 Global shipments of PCs showed a slight year-on-year improvement in the fourth quarter of 2017, up 0.7 percent to 70.6 million sales, according to International Data Corp. (IDC). Shipments for the entire year totaled 259.5 million units, a decline of 0.2 percent over the previous year, marking the shortest year-to-year decline for the market since 2011. "The 4Q17 results further validate the view of a steadying, albeit still weak, traditional PC market, buoyed mainly by commercial upgrades and pockets of improving consumer PC demand," according to a news release. Other factors that lead to a better than expected end to the year included a shift by companies toward the notebook market in response to declining sales for tablets and a push to get solid state drives, which were in short supply, into machines and sold off before supplies ran out, according to IDC. HP led the market, with 16.57 million shipments for a 23.5 percent share, marking an 8.3 percent increase over the same period in 2016. Lenovo followed with 15.704 million shipments and a 22.2 percent share, just 7,000 shipments short of their 15.711 total in 2016's fourth quarter. Dell held the third spot with 11.078 million shipments, good for 15.7 percent of the market and a 0.7 percent increase over the previous year's fourth quarter. Apple was fourth by market share, with 8.2 percent of the market and 5.77 million units sold. That was good enough for an increase of 7.3 percent over the same period last year. Asus and Acer ended in a statistical tie, capturing 6.4 percent of the market on 4.54 million shipments and 4,49 million shipments, respectively. They were also the only companies in the top five to see a significant year-over-year decline in shipments, with Asus dropping 11.2 percent and Acer dropping 8.1 percent.